​The Spherical Plain Bearing GEG.C Series consists of an inner ring with a convex spherical outer surface and an outer ring with a corresponding concave spherical inner surface. 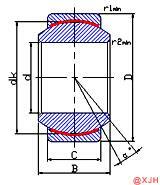 This design is particularly suitable for bearing configurations in which it is necessary to be able to adjust the centering deviation between the shaft and the housing, or to be able to reciprocate or periodically yaw or slewing at a relatively slow sliding speed. The Spherical Plain Bearing GEG.C Series consists of an inner ring with a convex spherical outer surface and an outer ring with a corresponding concave spherical inner surface. This design is particularly suitable for bearing configurations in which it is necessary to be able to adjust the centering deviation between the shaft and the housing, or to be able to reciprocate or periodically yaw or slewing at a relatively slow sliding speed. Spherical Plain Bearing GEG.C Series features a special sliding layer made of modern materials with extremely low friction. These bearings require no maintenance during operation. It is suitable for the following applications: bearings are required to have a long service life without maintenance, or working conditions (such as insufficient lubrication or no lubrication at all) do not allow the use of steel-to-steel bearings. Spherical Plain Bearing GEG.C Series is primarily used for directional heavy loads where it has limited ability to absorb alternating loads.